It is summer and time to celebrate a good tomato. I like making tomato salads like my parents used to make – with tomatoes, celery, fresh onion, basil or oregano, salt and good extra virgin olive oil. 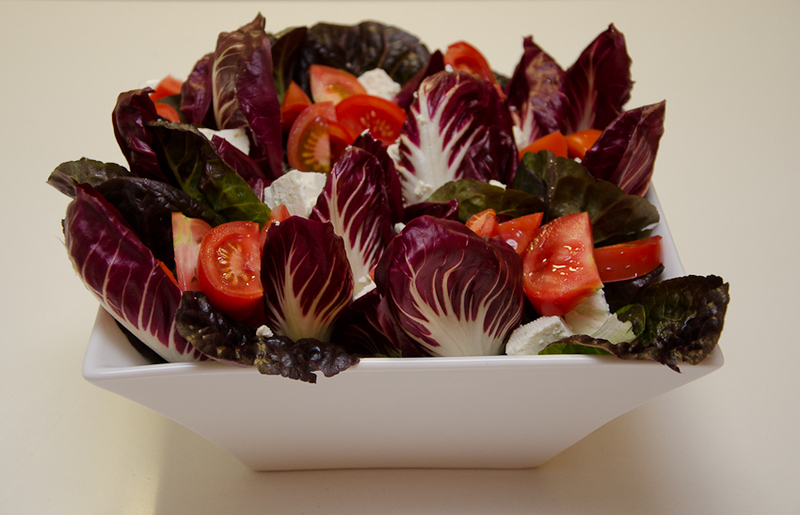 And as the mood takes me, I sometimes like to accompany a tomato salad with one of the following simple dairy trimmings, like: bocconcini or mozzarella, treccia, ricotta, straciatella , burrata or marinaded feta or a panna cotta made with feta or gorgonzola. Including the protein makes an excellent starter …..or as my parents did – eat a tomato salad with ricotta or bocconcini for lunch almost every day of summer. I was in Gippsland yesterday and visited Bassine; they make a range of cheeses on the premises. I have been there before and have purchased various cheeses, but yesterday I came home with some quark and thought that would experiment and make a savoury coeur à la crème. Coeur à la crème is usually served with berries but I thought that I could accompany my savoury coeur à la crème with a tomato salad. Alternatively roasted (or charred) peppers or slow roasted baby tomatoes would also be great… or fried red peppers (peperonata) or lightly sautéed zucchini and mint could be terrific…I could go on. You need muslin and a mold or container that allows drainage. I used a traditional ceramic, heart shape dish for making a coeur à la crème, but any container that is perforated with holes to drain off the excess moisture of the cheese or a colander can be used as an alternative. 250 gm each quark, 1 cup of Greek yogurt, 100g of marinaded feta, fresh thyme leaves ground pink peppercorns, 1 peeled clove of garlic, ½ cup pf milk, ½ cup good quality olive oil. In a small sauce pan warm the milk over low heat. Remove from heat and let steep for 30 minutes and then strain out. Combine cheeses and yogurt – you want the mixture fairly smooth so use a food processor or work it with a spoon. Add the thyme, ground pink peppercorns and infused milk. Line the mould with muslin (enough to cover the mold) and sprinkle with olive oil. Put cheese mixture into the mold, sprinkle with more olive oil and cover it with the left over muslin. Place the mold into a container or tray to catch the whey (liquid that drains away). Stand overnight in the fridge. Carefully turn the mold out onto a serving plate. Serve with a tomato salad or anything thing else that catches your fancy. Next time I make a ‘Coeur,’ I may try ricotta and herbs – no feta, no yogurt. Simple tomato salads feature very frequently in my kitchen – not surprising as local tomatoes and basil in summer are at their best. When I say simple, I mean made with basic ingredients – in season tasty tomatoes, fresh basil, spring onion, the inside part of the celery, salt and extra virgin olive oil. In fact, so simple that I have not written the recipe for a tomato salad in my blog. Just writing about tomato salad makes me want to have some – I can taste the fresh bread that I particularly like to use to mop up the juices. Good, extra virgin olive oil is as important as the quality of the tomatoes. I have inherited my like of tomato salads from my father; it is one of the things my father made well and my parents, especially when they were elderly would eat a tomato salad almost every day for lunch (accompanied with some sort of cheese, smallgoods, frittata, or left over meat or fish from the night before). This sort of tomato salad was not considered special enough to present to guests – it was family, simple, every-day food and to a certain extent it has remained so in my present home. Apart from the simple tomato salad made with spring onion, my father excelled in the salad his mother used to make (she lived in Ragusa, Sicily) with squeezed onions or as he used to call cipolla dolce (sweet onion) – the onion is made sweet by having the bitter juices squeezed out of it before it is used. This makes the taste of the salad unique and my children and nephews still mention this legendary version of a nonno-tomato salad. When they were in season the large, fresh, salad onions were his favourites (sold in bunches with the bulbs and part of the green stalk still attached) but the ordinary white or the red onions sufficed at other times. 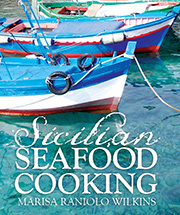 Cipudda is the Sicilian word for onion and cipolla the Italian. Probably because it is used extensively in Calabria, red onion is called cipolla calabrese or cipolla di Tropea in Italian, Tropea is a very picturesque, old fortified town built on a cliff overlooking a spectacular beach in Calabria. I now have the old colander my father used to use to strain the onion – this was one of the very few, kitchen implements that came with us from Trieste where we lived before coming to Australia. Amusing: in Italian a colander or strainer is called a scolapasta – scola means strain…and where would Italians be without an implement to drain their pasta! Expect to shed tears during this process. Place 2 large, thinly sliced onions in a colander, sprinkle with about 2 heaped tablespoons of salt and leave it for about 30 minutes. Do not be concerned about the quantity of salt, it will draw out the onions’ strong juices. If fresh onions are in season, leave the sliced onions with the salt for about 15 minutes. Use your fingers and palms to squeeze the onions inside the colander – the juices and the salt will just dribble through the perforations. My parents have always made tomato salad with firm, slightly golden, unripe tomatoes. Interestingly in Italy, tomatoes (pomodoro) were first called pomo d’oro, apples of gold and these early specimens were not necessarily red in colour. My father was making salad well before the heirloom varieties of tomatoes were available – he would have enjoyed using these tomatoes that come in a multitude of colours and variety of shapes. Interestingly, not all are coloured red. Cut the tomatoes into bite size pieces and add everything else and serve. From Comiso and Vittoria (towns south of Ragusa) and popular inland (in Enna and Caltanissetta) it is common to cut large tomatoes called (cuore di bue — ox heart), horizontally into halves, remove the seeds and stuff each crevice with chopped garlic, salt and extra virgin olive oil. On visits to the South of France I found that these tomatoes are popular and eaten in the same way. Surprise, surprise! These little beauties below were left by a neighbour at my door. I feel a tomato salad coming on. As a child I always enjoyed eating what my mother called uova al salmone – and no, she did not add smoked salmon, they were really scrambled eggs in a tomato salsa, made in summer with fresh tomatoes, and the same salsa that was used to dress a summer pasta. The colour of salmon is the result of scrambling eggs in salsa and uova strapazzate al pomodoro may have been a more appropriate name for this dish, but I, like my mother have always called it by this name (see second recipe). What I really want to write about is what I call Turkish eggs (probably out of ignorance) – and not been Turkish I will not say that they are authentic and try to give them a name in Turkish. This is how I like to make them. To make uova al salmone, add diced, peeled tomatoes, salt and pepper and a few fresh basil leaves to a pan with some extra virgin olive oil and simmer for about 10 minutes. In a bowl, beat eggs then pour into the pan with the tomatoes and stir constantly. When they are creamy and cooked add a few leaves of fresh basil and serve. What I really want to write about is what I have always called Turkish eggs – and not been Turkish I will not say that they are authentic and try to give them a name in Turkish but this is how I like to make them. And they are not just Turkish: they could be classed as Middle Eastern and I have eaten them in Tunis as well. There are different versions of this Middle Eastern dish and many of them poach the eggs in yoghurt. For 4 people, I use 8 eggs. Sometimes I have also added peppers (one or two thinly sliced – either the conventional ones, any colour or the long peppers slender ones (my mother always referred to these as frying peppers). If adding peppers, add them at the same time as the onion. Some also add Turkish sausage (called different names in different countries so I am not even going to try to give it its’ name as I could be off beam). Although you can scramble the eggs, I like to poach them and I also like to add either parsley or coriander, cumin and/or caraway seeds. Warm the olive oil in fry pan or pan with deep sides, then lightly fry the onions (and peppers) without browning. After about 2-3 minutes add the chopped tomatoes. Season with salt and pepper( spices and/or herbs) and cook for 7-8 minutes until soft. Serve in the pan. I like fresh bread with mine, especially to eat the yolk. I had some left over cooked prawns I wanted to use up and thought that a sauce would liven them up. Salsa Romesco is said to have originated from Tarragona, a town close to Barcelona in north-eastern Spain. It is an old Roman town so you can be partly forgiven if you thought that the sauce originated from Rome. I consulted many sources and there are so many variations to making this Catalan condiment, but the most common ingredients seem to be garlic, red peppers, tomatoes, white bread and almonds. 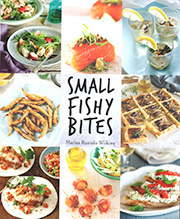 Most interesting is that the recipes from respected food writers, e.g. in Honey From a Weed, (Patience Gray), Mediterranean Seafood (Alan Davison) and Mediterranean Food (Elizabeth David) the main ingredients are tomatoes and the peppers are either paprika or chillies or dried red pepper flakes. Some recipes include sherry vinegar or wine (rather than wine vinegar). Some have hazelnuts or walnuts as well as the almonds. There are a few recipes where the bread is first soaked in vinegar and then squeezed dry before it is added to the blend (like when making salsa verde) and others where the bread is toasted in the oven. Those who are serious romesco – makers make it in a mortar and pestle and also roast or char the tomatoes. If peppers are used these are also charred. I have found references to small red peppers which are often referred to as romesco peppers in Catalonia, so perhaps this is why the name. Because my grandmothers were Sicilian and this is a Catalan recipe, I cannot say that this is how it is made in my family, however I can give you what has worked for me. There is always room for improvement and I will keep on experimenting. This sauce is usually associated as a condiment for shellfish and fish. It is also good with grilled and roasted vegetables (especially cold, left over ones that need dressing up the next day). I usually add a couple of roasted tomatoes to my roasted pepper salads and I conveniently had some in the fridge left over from the night before. I keep roasted garlic covered in olive oil in the fridge, and using up ready made ingredients is often a strong reason why I make certain things in the first place. Heat ¼ cup olive oil in a fry pan sauté the bread until golden. Roast the garlic whole (Preheat oven to 200 °C, wrap in foil and bake). An easier option is to sauté the peeled cloves of garlic in the same frypan after you have pan-fried the bread. Toast the blanched almonds or alternatively sauté them in the same frypan. Place the bread, and almonds in a blender and pulverize. Add the rest of the ingredients and blend until it forms into a thick, smooth-ish sauce. If the sauce is a too thick, add a little water to thin it down. Left over braises make excellent pies. 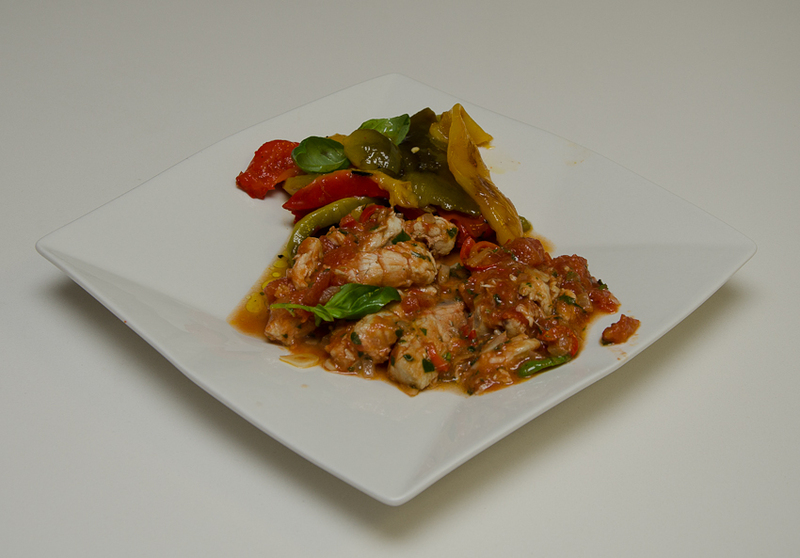 Recently I spent time with her in Queensland and this fish braise was her idea – she thought it had Sicilian flavours, and it does. I thought that she was using far too much garlic and too many chillies in her recipe for it to be Sicilian, but she carried on regardless. I have to admit that the resulting fish braise tasted great; the flavours melded into a mild, sweet flavoured sauce with subtle tastes. We ended up with a thick fish soup (Zuppa Di Pesce) and ate it with bread . I complemented her dish with some roasted peppers – they are in season in Queensland and I was able to purchase red, yellow and green peppers. These complimented the fish braise very well. Both of us always cook too much food (just in case people are hungry), but also because we can both use leftovers creatively and needless to say we had fish braise and peppers left over, hence individual pies for the next day – these were my idea. Some people hate anchovies; omit them all together, or use white anchovies if you prefer a milder taste (called boquerones). ¾ cup of chopped parsley, fresh oregano and basil. Cut fish fillets into serving size pieces, rub with a little salt and pan-fry them in a in a large frying pan with a little of the oil. Remove them and set aside. Heat the rest of the oil and over medium heat sauté the garlic and chilli until the garlic begins to soften – leave some of the seeds in the chillies if you like hot food. Stir in chopped anchovies until they dissolve. Add the wine and evaporate for 2-3 minutes. Add the tomatoes, herbs and a little salt and cook the sauce until it is reduced. (Remember that the anchovies will be salty). Add the fish pieces and gently press them into the sauce. Ensure that the sauce covers them, and heat through. Check that the fish is cooked to your liking. Spoon the fish braise onto plates and serve with some crusty bread. Use the left over fish to make pies. We also included a layer of roasted peppers on top of the fish before topping with the pastry. 250g plain flour, 120g cold butter cut into small cubes, 2 tbs extra virgin olive oil, 1-2 tbs cold water, a little salt. Put flour and salt into a bowl, add butter and oil and rub it into the flour until it resembles bread-crumbs. Alternatively use a food processor. Add just enough cold water to bind the dough together – use the blade of a knife to do this. Wrap the dough in plastic wrap and chill for at least 10-15 minutes before rolling out and cutting it into the shapes that will cover the pies. Spoon cold fish braise into oven-proof bowls (we made 4 individual pies). Do not include too much of the braising liquid – see photo above. Top with strips of roasted peppers (optional). Bake in preheated oven, 200C until golden (15-25 minutes), then cool pies on a wire rack. We accompanied the pie with this salad. I love Flathead. My fishmonger prefers to sell it as fillets, but I prefer to cook it whole especially if I am braising it; it is an ugly looking fish, but the bones and head add taste to the braising liquid. Many eaters dislike picking out bones from whole fish, however if the spine is lifted out carefully and kept whole, this does not have to be a big problem. For two people I used one Flathead (600g -700g) and this recipe can be adapted for fillets; use large sized fillets to prevent breakage. Other white fleshed, medium flavoured and textured fish suitable for this recipe are: Snapper, Leatherjackets, Whiting and Garfish. The fish is cooked very simply and al crudo (using all raw ingredients and all in the pan at the same time); it relies on the fish being fresh and the tomatoes being sun ripened and flavourful. Mint is rarely used in Italian cooking but it is often added to Sicilian cuisine. These quantities are suitable for 1k of fish. If using whole snapper, which is a larger fish, increase the cooking time and add a little more liquid to the pan. 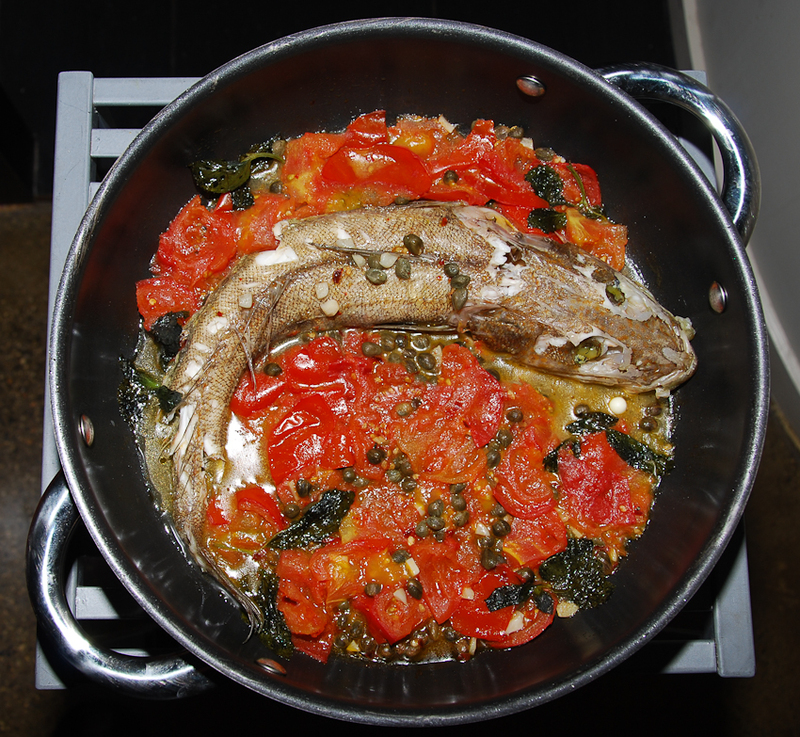 Arrange the fish and the tomatoes in a low saucepan so that the fish can be fitted in one layer. Add seasoning, extra virgin olive oil, garlic, the finely cut mint and capers. Cover the fish and cook on medium heat for 7-13 mins if you are cooking whole fish and about 5-7 minutes if they are fillets – this time will vary depending on the size of the fish and how much you like your fish cooked. Take off the lid and cook on brisk heat until the tomatoes have thickened. Avoid stirring or turning the fish to prevent breaking. Decorate with fresh mint sprigs. One of my readers sent me a recipe for a tomato salad and gorgonzola and as you can see from the photos I made the salad twice. On both occasions I presented the salad as an antipasto. The reader who sent me the recipe has just returned from a holiday to Italy; although she visited Sicily, she indicates that she ate this in northern Italy. And even if all of the other ingredients could easily be for a tomato salad from Sicily, gorgonzola is very much a northern Italian cheese. In fact it is a DOC cheese (Denominazione di Origine Controllata – Protected Designation of Origin) and produced in the provinces of cities you may recognize: Milan, Como, Pavia, Bergamo, Cremona and Novara and all of these cities are in the Piedmont and Lombardy regions. Only items produced in a specific area, in a particular way and of a certain specified size and shape may display that DOC label. In my version of the salad I used gorgonzola dolce (means sweet) and it is one of my favourite cheeses – soft, creamy and slightly veined and spicy. Gorgonzola piccante (spicy) is the stronger tasting version of this cheese; it is more matured, has a greater degree of blue-veins and is firmer. I imagine that although both cheeses are suitable for this recipe, the mature gorgonzola would be easier to handle and could be ‘shaved’ as the recipe suggests. I also did not use as much balsamic vinegar, the Sicilian in me screams “no vinegar with tomato”– it is sufficiently acidic. Also, it has to be good quality balsamic and if it is, only a little should suffice. When I prepared it in my friends’ home, I did not use anchovies because they hate them (unfortunately). I have named the salad after the ingredients INSALATA DI POMODORI E GORGONZOLA (and alla Giovanna, because this is the reader’s name). Thank you. I used very large tomatoes from Geelong close to Melbourne (new crop). The tomatoes are small and from Murray Bridge in South Australia. Heirloom tomatoes are not ready, not just yet.